Medium size, stainless steel case, silver dial, automatic winding mechanical movement with chronograph function, alligator strap with deployant buckle. Water resistant to 100 meters (330 feet). Medium size, stainless steel case with 18K rose gold bezel, silver dial, automatic winding mechanical movement with chronograph function, alligator strap with stainless steel and 18K gold deployant buckle. Water resistant to 100 meters (330 feet). Medium size, 18K pink gold case, silver dial, automatic winding mechanical movement with chronograph function, alligator strap with 18K gold deployant buckle. Water resistant to 100 meters (330 feet). Medium size, 18K yellow gold case, silver dial, automatic winding mechanical movement with chronograph function, alligator strap with 18K gold deployant buckle. Water resistant to 100 meters (330 feet). Medium size, stainless steel case, white rubber covered bezel, silver dial, automatic winding Cartier calibre 076 movement, SMALL white rubber strap. Water resistant to 100 meters. Medium size, stainless steel case, silver dial, automatic winding Cartier calibre 076 movement, pink alligator strap with stainless steel deployant buckle. Water resistant to 100 meters. 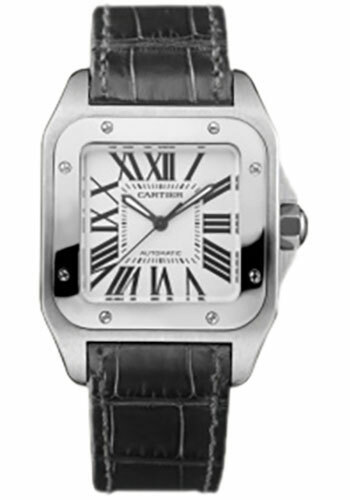 Medium size, stainless steel case, white rubber covered bezel, silver dial, automatic winding Cartier calibre 076 movement, EXTRA SMALL white rubber strap. Water resistant to 100 meters. Medium size, stainless steel case, green mother of pearl dial, automatic winding Cartier calibre 076 movement, alligator strap with double deployant buckle. Water resistant to 100 meters. Medium size (44.2mm x 36.95mm) stainless steel case ADLC coating, 18K pink gold bezel, black dial with Roman numerals, automatic winding Cartier calibre 076 movement, fabric strap with ADLC coated security buckle. Water resistant to 30 meters. Medium size (44.2mm x 36.95mm) stainless steel case coated with ADLC, sapphire back, octagonal crown with set with a faceted black synthetic spinel, polished stainless steel bezel with screws coated with ADLC, black dial with Roman numerals, automatic winding Cartier caliber 076 movement, fabric strap with ADLC coated steel security buckle. Water resistant to 100 meters. Medium size, 18K white gold case and bezel set with diamonds, silver opaline dial, automatic winding mechanical movement, alligator strap with deployant buckle. Water resistant to 100 meters (330 feet). Medium size, 18K yellow gold case and bezel set with diamonds, silver opaline dial, automatic winding mechanical movement, alligator strap with deployant buckle. Water resistant to 100 meters (330 feet). Medium size, 18K pink gold case and bezel set with diamonds, silver opaline dial, automatic winding mechanical movement, alligator strap with deployant buckle. Water resistant to 100 meters (330 feet). Medium size, 18K white gold case set with diamonds, dark grey mother of pearl dial, automatic winding Cartier calibre 076 movement, alligator strap with 18K gold double deployant buckle. Water resistant to 100 meters. Medium size, 18K white gold case, diamond bezel, silver opaline dial, automatic winding Cartier calibre 076 movement, white rubber strap. Water resistant to 100 meters.